So far, we’ve seen some mixed reviews for Gran Turismo 5. Some folks have stamped it with a 10 and called it racing perfection, while others have lesser feelings for Polyphony Digital’s machine, stamping it with a 7 (!!) or 8 and saying that work could’ve been done in certain areas. Hey, to each their own. Ratings are just numbers that people plaster on their reviews to express how they feel, but by no means should they affect whether or not you should take the drive. At the end of the way, Gran Turismo 5 lives up to all of Polyphony Digital’s promises, and you’ll have a wonderful time, speed bumps and all. Do you enjoy the race in Grand Turismo? Don’t go into Gran Turismo 5 expecting an arcade experience. This is a simulation through and through, with over a thousand licensed cars to choose from and 70 track variations that you’ll eventually make your way across. It’s a slow but steady climb, as you’ll choose your mode (A-Spec or the speculation-based B-Spec, where you guide an AI racer through his paces) and level up accordingly, earning access to more cars, modifications and bigger and better tracks with each new completion. It sounds like an uphill climb, but we prefer to think of it as a comfortable yet thrilling ride, one we feel progression with through each glorious finish. You might think that A-Spec is the main highlight, but, to be honest, you should give B-Spec a try. Here, you’ll have a hands-off approach to racing, yet it teaches you some of the finer basics that you can apply when you return behind the wheel. Yeah, it’s a little dull at first, and you really start to itch when you see an AI driver make a mistake, but hang in there and the experience will reward you, and you’ll even gain a finer appreciation of what goes into a racing team. It isn’t just the driver and the folks behind them. They work together. Modes in the game go so much deeper than A-Spec and B-Spec. An arcade mode lets you check out quick events, such as drift trials and time trials, to help get your skills up. Detailed photo modes allow you to take your dream pictures and use them as wallpaper, using whatever cars and locales you have access to. It’s cosmetic more than anything, but screw it, it’s worth exploring. The addition of NASCAR is a nice touch, especially with Jeff Gordon guiding you through all the options and teaching you the finer art of the bump draft. It’s been a while since we’ve seen a fitting tribute to the thunderous sport of stock cars, and we’re happy that Polyphony Digital has given it prompt attention. If you like all forms of racing, you’ll also want to give kart racing a try. No, there are no turtle shells or ridiculous road slicks, just the smaller style of racing, perfect for when you’re tired of traveling in a big, bulky car. It would’ve been nice for kart racing to have its own circuit, but we’re pleased that it’s present and accounted for in any form. Since we’re months away from doing the real thing again (it’s damn cold here in Denver), we’ll take it. Online racing hasn’t been the most paid attention to feature in Gran Turismo, but this time around, Polyphony manages to get it right. You can form your own private areas to chat with racing enthusiasts, spectate races while waiting in line for the next event, and compete against others in true Gran Turismo fashion. In the time we’ve dabbled with these services, they’re quite satisfactory, and will hopefully lead the way for more expansive online services to come in Gran Turismo 6. 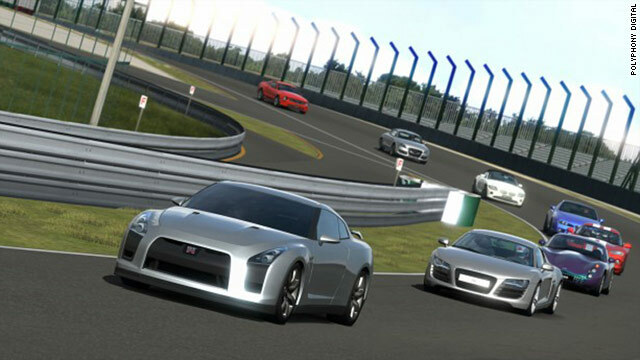 What’s more, if you want to race locally, Gran Turismo 5 provides split-screen two-player racing. We’re happy with the single player experience, but split-screen works very well here, and you’ll want to invite friends over just so you can show off without screaming into an earpiece. Gran Turismo 5’s handling isn’t far off from previous games (particularly GT 4 and, of course, Prologue), but that isn’t a bad thing. Polyphony has been paying strict attention to how a car handles over the last few years, and it really shows here. Each of the car models handles just like their real counterparts (based on our experience), from the way you have to brake around turns (to avoid a collision or, worse yet, a time-consuming spin-out) to that first victorious pass against an aggressive opponent. We have no complaints with the car handling here, and even the trickier parts of the game, like mastering the draft, can be learned with a few laps around the track. Don’t be afraid to experiment, and if you crash, hey, try again. Once you do get the hang of racing, Gran Turismo 5 opens up with its leveling system. Soon enough, you’ll gain access to more cars (which you buy in a neat virtual shop), more tracks and Special events, where you really get to test your racing mettle. With so much to unlock (including the elusive X1 Prototype – good luck with that), you’ll be digging for days, if not weeks. As for Gran Turismo 5’s graphic design, it’s simply dazzling. The car models are absolutely realistic, right down to the glossy paint jobs, the tire reactions, the crazy-real cockpit views (the driver’s hands react very accordingly) and the stunning track detail. Our runs through Rome and Kyoto were unforgettable, to say the least, and Nurburgring, despite its toughness, left us bewildered with delight. The game runs at a very steady frame rate, barely dipping or losing any ounce of its detail. That said, there are a couple of minor things to address. First of all, the game has loading times. Even if you opt for the optional 8 GB install, you’ll find yourself waiting a little bit longer for races than you might expect. It’s a lot to process, so if you can provide some understanding, you’ll get through it. The second is a little more serious, and will probably irk driving enthusiasts – damage modeling. Polyphony made a big deal about this when they introduced it into the game, and the final effect is more cosmetic than car affecting. You could ding up a front end to the point it’s showing off a killer smile and yet the thing will run like new. We certainly don’t mind, but some of you might wonder if this factors in against the overall realism. Really, though, you shouldn’t let these get to you. In the end, Polyphony Digital invested roughly $60 million into this engine, and every cent shows on-screen, especially with the replays. These dynamic cut-aways aren’t just worth viewing, but also saving to your hard drive. We’re sure there’s a remarkable run or two you’ll want to savor. Then there’s the audio. The sound effects and car engine noises are particular to their models, so you won’t hear an Audi sound like, say, the Red Bull car. They’re authentic and deeply studied, and they sound terrific – especially the higher-end models. The soundtrack, however, isn’t the greatest. Some of the songs are perfect, but others, eh, not so much. Fortunately, Polyphony makes up for this by letting you customize your soundtrack, or incorporate your own tunes into the XMB. Hell yes. As for the other stuff, like Gordon’s narrations and other ambient noises, they’re fitting to the product. Last but not least, the game does provide 3-D support, and as we mentioned in our hands-on impressions at E3, there’s nothing quite like it. However, you’ll need to have the proper equipment to really take advantage of it, such as the special eye-wear and the $2K-priced TV. But perhaps this is the game to help get you off on the right foot with buying the technology. We wouldn’t be surprised if Best Buy ran it like a non-stop demo over the next month (now that they realize what the game actually is…maybe). Gran Turismo 5, to some, won’t be “the ride of your life”, as the damage modeling and long loading times may be a no-sale for the ultra-finicky, or, in some cases, certain game journalists. But with its unmatched gameplay still intact, its abundant features guaranteed to keep you playing for months, and the kind of visual presentation that will make your eyes water in appreciation, you owe it to yourself to take it for a test drive and, eventually, park it in your permanent library. Until Gran Turismo 6 trumps it (someday), this is yet another piece of refined next-gen racing. Don’t you dare let it pass you by.